From January 1, 2018 it is prohibited to bring waste tires, tire casings, automobile inner tubes and other materials that can be reused, to the landfills (Federal Law No. 89-ФЗ. Art. 12 par. 8). The equipment is a flexible configurated system, it can be installed in the premises of any shape. 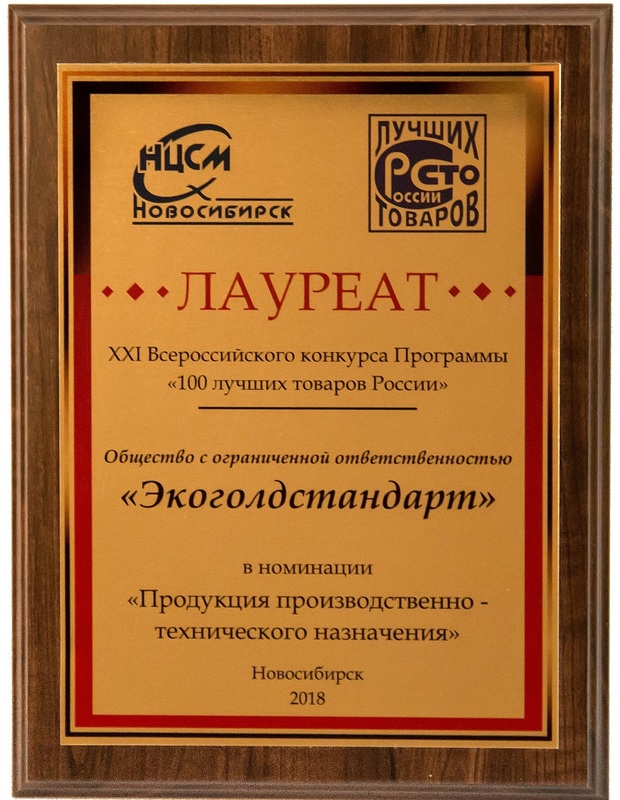 Our company became the winner of the XXI All-Russian Program Competition "100 best goods of Russia" in the nomination "Production of industrial and technical purposes"
Leave an application on the website. The Manager will call you to appoint a time for the presentation of the line. You will come to the presentation of the line, agree details. You will sign the Contract, pay the prepayment of 25%. We shall produce a line according to the Contract terms & conditions. We shall perform an acceptance of the line, shipping and delivery to you. You will pay the remaining 75%. We shall perform an installation supervision of the line, training and commissioning. The fundamental difference between the EcoGold and EcoGold Euro lines is that the EcoGold Euro line is equipped with German electric motors and Italian gearboxes. The unit is designed for cutting the worn OTR tires of radial and diagonal ply, off the road tires (OTR) with the outside diameter of up to 3.5 meters, into parts (chips) weighing up to 20 ... 30 kg. The unit is designed to recycle tires with thick bead wire in the rim. The unit operates independently as an equipment in receiving stocks, as well together with technological line for recycling of tires. Can be used outdoors or indoors at temperatures from -30 to + 400С. The function of hydraulic shears, both independently and as a part of the production line for grinding the rubber into crumbs, produced by the company EcoGold, is to cut single-piece tires into parts of a size suitable to be recycled with the standard equipment. Our standard lines are designed to recycle all existing types of tires in the world. The unit cuts tires in segments. This increases the productivity of the equipment in 2 times in comparison with other manufacturers. Car tires can be crushed into fragments of almost any size. At that the tires are decreasing in their volume at least for 5 times! This makes the material cheaper for storage, easy to load, transportable and convenient to further advanced processing into rubber granules. Also hydraulic crocodile shearing machine can cut conveying belt, industrial rubber, plastic products with metallic inclusions and other materials to be recycled. Low power consumption at high performance. To work with hydraulic shear you do not require special training, qualified personnel can serve the unit immediately after the instruction. Hydraulic shear easily can be operated by one operator. Tire is put by means of beam crane onto lower knife, and the upper knife goes down and cuts it into pieces with the size required. Hydraulic shear is mobile and easily transportable. Also hydraulic shear can be connected to mobile electrical generator. The Shredder crusher series RTSC (ДДР) is designed for crushing tires with precut bead ring and for cutting the rubber into pieces of width from 20х20 mm with varying lengths. The Shredder crusher can recycle both whole tires and pieces of OTR tires. The Shredder crusher has independent drive on each shaft that provides high efficiency and best performance. The double-rotor Shredder crusher has low noise levels of operation, the highest torque and low rotation rate. The double-rotor Shredder crusher is equipped with a protection system against mechanical and electrical overloads. Our company also fabricates single-rotor and double-rotor Shredder crushers with prepressing function to grind any heavy, oversize bulky waste such as polymers, wood: pallets, stumps, sleepers, etc. You can order a full set of equipment necessary for production process, which will be optimally rendered and adapted to your objectives and provided with technical and technological support. We perform installation supervision, commissioning, warranty and post-warranty maintenance. Our experts will hold consultations on the proper preparation of the production premises for equipment installation and laying the necessary communication and carry out personnel training. Eco Gold Standard is not only a manufacturer of lines for recycling of tires and industrial, we also manufacture lines for production of coatings based on rubber crumb. Namely, carpeting, tiles of different shapes and sizes, with varied patterns and palette. This product type is applied to all possible surfaces providing aesthetic appearance and lifespan of more than 20 years. The Eco Gold Plit Line is fully manufactured in Russia by means of Eco Gold Standard LTD facilities. Products manufactured by EcoGold Plit Line is used for playgrounds, athletic fields, parking lots, building surrounding grounds, recreation areas, garages, parking lots, pools, etc. Carpeting, tile and pavers based on crumb rubber are considered to be innovative, unique in quality and functional product, enjoying high demand. Our company offers new technology and manufacturing equipment that allows to produce a wide range of rubber tiles and to reduce to zero the percentage of defective goods. When you purchase our Line you get not only a complex of equipment for the production of tiles, pavers and carpeting, but the technology for the production of seamless coverage based on crumb rubber as well.